Royal Enfield motorcycles look great with a sidecar attached. 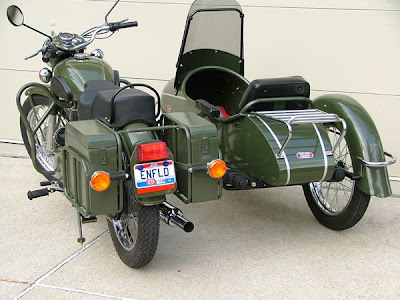 But one combination not often seen is a sidecar with the Military model. An anonymous comment from a reader raised the question: why not? It's certainly appropriate on a Brit-style motorcycle like the Royal Enfield. 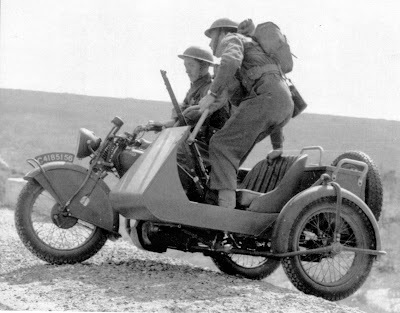 The British Army used many motorcycle sidecars, often fitting them for combat with light machine guns. Home Guard exercise with Lewis guns, 1941. Sidecar looks almost homemade. Getting the machine gun might be touchy, but there is no problem obtaining the sidecar. 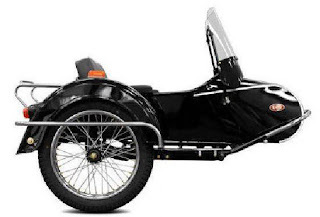 Classic Motorworks, the U.S. importer of Royal Enfield motorcycles, offers sidecars for sale. Travis Andersen at Classic told me there is no special problem fitting one of them to a Military model. The attachment points are the same and the pannier boxes do not interfere. There are photos of a Military with a Cozy Rocket sidecar on the firm's Cycle Sidecar web site. Andersen said he has seen this motorcycle, and it has a clear coat over its paint, producing a glossy finish. Classic offers sidecars only in black, so getting the paint to match your Military is your problem. It would be easier if your bike has a flat, olive drab paint job and you're willing to sacrifice shine for authenticity. 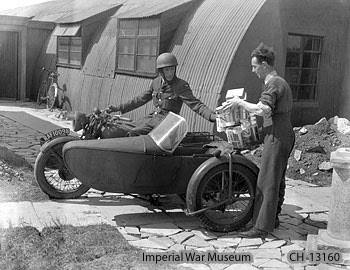 RAF courier is handed target films for delivery in 1944. His sidecar may be a civilian model pressed into service. 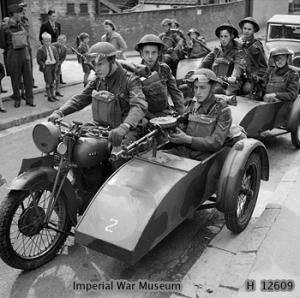 Photos from the Imperial War Museum show several types of sidecars in use with the British Military in World War II. 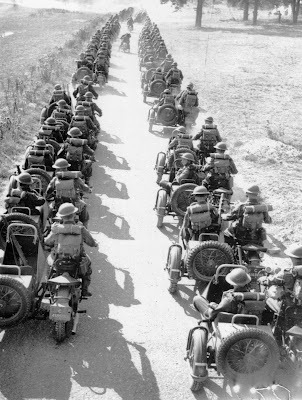 Everything that would roll was pressed into duty, so it shouldn't matter that Classic's Cozy sidecars look distinctly comfortable and civilian in comparison to the 1940 War Office variety. This Cozy Euro model, with its canoe shaped prow, looks much like the RAF sidecar pictured above. Northumberland Fusiliers exercise, summer of 1941. A slab sided open box with grab handles and spare wheel on the back would look more war like. But do you really want to enlist to ride in that thing? Hi David, the Norton Big Fours you show, have sidecarwheeldrive, and are a blast to drive offroad!!! here's a picture of my restored one with a 91 year old Dunkirk veteran at the handlebars, he drove me around!! !